A new (temporary) protected bike lane in Rogers. The final report on a series of month-long bicycle infrastructure pilot projects that took place in Bella Vista, Bentonville, and Rogers in the fall of 2016 has been released, outlining successes, lessons learned, and next steps for making Northwest Arkansas a better place for bikes. Funded by the Walton Family Foundation, the initiative was spearheaded by the Northwest Arkansas Regional Planning Commission and BikeNWA, with the national urban planning firm Street Plans providing expert counsel. These pilot projects brought principles of Tactical Urbanism—a process committed to low-budget, site-specific, rapid-turnaround, community-guided “test before you invest” solutions—to bear on unique challenges faced by each city. In all three instances, our primary goal was to assess the viability of long-term bike/ped solutions through short-term installations, namely low-stress, high-comfort, and efficient connections between important destinations for people riding bikes. In Bella Vista, the project team set out to close the loop around Lake Bella Vista and link the Razorback Greenway to the Blowing Springs Trail System and Cooper Elementary School to the north. In Bentonville, the objective was to better connect the Downtown Trail, which bridges the gap between the Razorback Greenway and the Walmart Home Office, to the Bentonville Square. In Rogers, the team sought to create a low-impact network of on-street protected bike lanes and neighborhood greenways that would allow people to safely ride their bikes between the Rogers Activity Center, Downtown Rogers, the Railyard Bike Park, and the recently renovated Lake Atalanta. From planning to execution, the pilot projects took two months (September thru October), and stayed in place for one month (to coincide with the International Mountain Biking Association’s World Summit, held in Bentonville last fall), during which time we gathered survey responses to compare with data collected before the implementation phase, thereby allowing us to assess impact and community buy-in. The brief lifespan of the projects was due not to any lack of success, but rather as a result of our promise to each city that these temporary installations were intended to explore possible solutions, as opposed to permanent, untested changes. We learned a lot from these projects, but the lessons can be roughly grouped into three main categories: planning, implementation, and use/impact. More than 200 people contributed ideas during the planning phase. With any endeavor, careful planning is critical for success. Each pilot project was decided through public charrettes, which combined residents’ knowledge of their communities, city and regional planning staff expertise, and the expert counsel of Street Plans, which literally wrote the book on Tactical Urbanism. In total, more than 200 people participated in planning these pilot projects. That’s a fantastic turnout, but we want to see even more Northwest Arkansans get involved and have a say in the future of their cities. To participate in the process, you don’t have to be a cyclist. You don’t have to have any technical expertise. And you certainly don’t need to have mastered all the jargon. (Although we’d be happy to help you learn it.) All you need is an understanding of your community and a desire to make it better. 50 volunteers put in 53 total hours of work to implement the three pilot projects. All the planning in the world means little if a project is not implemented in an effective manner. When making changes to streets where people driving, walking, and biking all interact, careful attention must be paid to the use and type of materials. For these projects, materials were carefully selected to implement the safest pilot projects possible, given the amount of time that they would be on the ground. These included yellow, white, and orange marking paint, traffic tape, and “armadillos” and bollards that complied with MUTCD standards. Support from city staff and volunteers was another critical aspect of implementation. It took 50 volunteers a total of 53 hours to build these projects. This provided a wonderful opportunity for residents to actively engage in bettering the built environment of their city while bonding with like-minded advocates. Next time, we hope to see even more of our fellow Northwest Arkansans come out to improve their communities. You don’t need any prior experience with this kind of stuff to be an enormous asset. Showing up is the most important step. Cyclists taking advantage of new bike infrastructure in Rogers. One of the primary measures of success for a pilot project is simple: whether people use it and like it. In Bella Vista, the response was overwhelmingly positive among all users. Trail users loved the safe connection to the Blowing Springs and Back 40 trail systems. The closed loop around Lake Bella Vista was also a success due in large part to the fact that the unique design of this particular pilot project separated people riding bikes from people walking and driving, thereby minimizing conflicts between user groups. As more and more people avail themselves of Northwest Arkansas’s ever-expanding network of paved and soft-surface trails, the need for separated facilities will only increase. All in all, the results of the Bella Vista project suggest that, with some minor changes, it should be made permanent. In Bentonville, survey results indicate that a more thorough assessment of cyclists’ needs should be conducted before settling on a permanent link between the Downtown Trail and Bentonville Square. The important lesson learned from this project is that not everyone is ready for a shared-use street space where cyclists and cars mix. The neighborhood greenway concept has been successful in other places, but the data makes it clear that Bentonville residents perceive this type of facility to be less safe than other options. In fact, over 65% of respondents indicated a preference for protected bike lanes to connect these popular destinations. In Rogers, we learned that more attention should be paid to assuaging the concerns of business owners confronted with a reduction in storefront parking spaces. We know from the implementation of protected bike lanes in other downtown areas across the country that bikes mean business and that patrons who arrive by pedal power can (and often do) more than make up for the perceived loss of income that many associate with a reduction in parking spots for cars. Nevertheless, 30 days is simply not enough time for the economic boon linked to bike lanes to materialize, especially when infrastructure improvements of the kind in Rogers were meant to induce new trips by bike (as opposed to increasing the ease and degree of safety with which existing trips are made). Ergo, future pilot projects like the one in Rogers should remain in place for 6-12 months to give residents more time to adjust to the change and provide more considered feedback, which will, in turn, enable cities to develop better permanent solutions. As a result of significant investments by Northwest Arkansas communities, we are quickly becoming known for world-class paved and soft-surface bike infrastructure. Nevertheless, there’s still a lot of room for improvement, and part of BikeNWA’s mission is to keep things moving forward. Ultimately, our dream is a region where people of all ages and abilities feel comfortable riding bikes for recreation and transportation. One way to accomplish this is through re-allocating space on new and existing roadways to safely accommodate people riding bikes and people driving cars, thereby narrowing roadway widths and reducing the speed of traffic while increasing total volume. In short, these pilot projects are proof that you can accomplish a lot with very little. We are currently engaging other municipalities and residents in Northwest Arkansas to implement three more pilot projects in the coming year and are optimistic about seeing some of them become permanent fixtures of our communities. 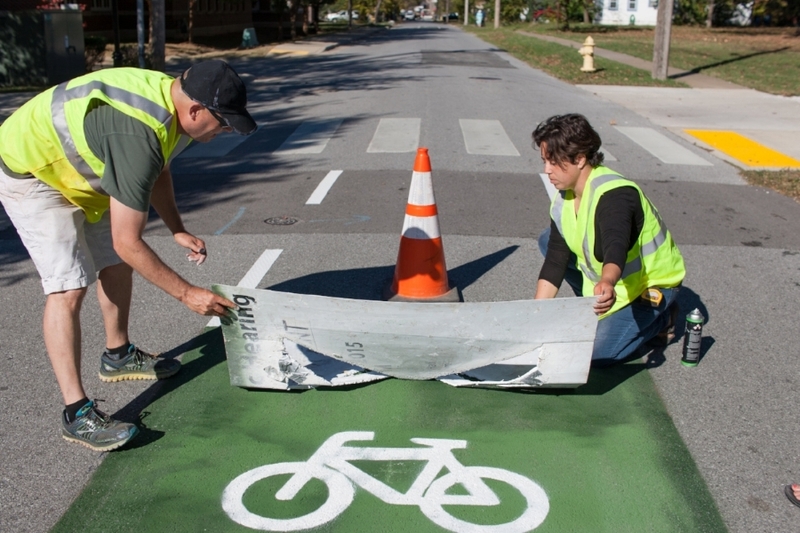 If you have an idea for a project in your community, let us know at info@bikenwa.org. To learn more about these pilot projects, download the complete final report here, and stay up-to-date on future projects by signing up for BikeNWA’s mailing list.